Posted on December 19, 2011, in Blue Monday, Jalisco, Mexico, Postcards from Paradise, REDnesday, Ruby Tuesday, senryu, Straight Out of the Camera Sunday, Tonalá. Bookmark the permalink. 13 Comments. Amazing patience and skill involved in this intricate artwork! Lovely perspective! I admire this lovely art form. Oh, how I wish I could draw or paint! Beautiful photo. That’s the labor of love! My BLUE. Have a wonderful week full of love and joy for the holidays! That is one true talent! Visiting for BM! Hope you can visit mine too..
You have been nominated for the “Versatile Blog Award”. Very nice shot. I love the red and blue as well as the angle you shot this at. The fact that you left the face out of the scene makes it all the more mysterious! 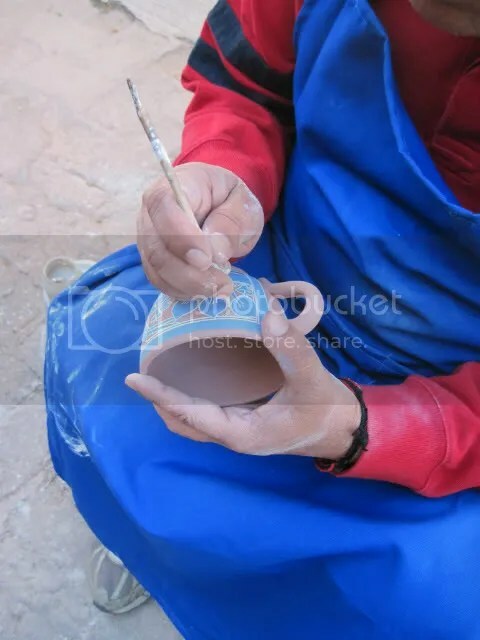 Pottery is not bad either! Such exacting, precise, and beautiful work. I love watching creative people work. The world is full of so much talent that we never know about. This is wonderful. I could never do anything like that. What a great find! Great shot. Wow, a hand made cup, Great work.